Climate Variability and Change for Water Resources Management - International Edition describes the terminology, global evidence, regional manifestations, and basic science of global climate variability and anthropogenic change, with a focus on water resources management. The lesson presents this information using rich graphics, animations, and interactions. Key messages are highlighted from the 2014 Fifth Assessment Report produced by the Intergovernmental Panel on Climate Change (IPCC). 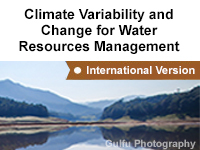 The intended audience for Climate Variability and Change for Water Resources Management - International Edition includes managers and professionals working in water resources planning under variable and changing climates. This includes people who are somewhat removed from the implementation of climate change policy, but still need to be conversant in the topic.